This 1837 house museum is visited by a ghostly cat that appears as a misty ball of fuzz, an apparition of a young boy, objects that move by themselves, and strange voices and sounds, like that of sleigh bells. Some visitors have experienced uneasiness and even nausea inside the house. Folks here have seen strange flashing lights and heard the sounds of a baby crying and an eerie screeching. The tiny cemetery surrounded by a short stone wall is said to be haunted. Folks have reported seeing a misty woman with long blonde hair and a black shadowy figure that moves very quickly. Also reported have been cold spots and uncomfortable feelings of being watched or even touched. Also known as the William A. Hall House or the Babbitt House, the inn, housed in a structure originally built in 1892, is said to be haunted by a ghost who resides in the Cook's Room. Visitors to this cemetery have reported "negative vibes" and a feeling that they are being followed. When they turn around, no one is there. The inn, built in 1834, is believed to be haunted by an entity that has been noticed in the ballroom as well as in other places around the premises. In addition, a female ghost has been known to haunt Room 3. Near the Dalrymple Hall and Howland Dormitory, a female apparition is said to wander, making students in these dorms feel uneasy. Cold spots have been reported as well. Allegedly haunted by the ghosts of former occupants, possibly a woman who died there in childbirth and another female ghost that is occasionally seen in the dining room. Folks here have noticed an apparition of a man in blue jeans and a plaid flannel shirt with a tape measure on his belt. He walked along the plaza, disappearing into a plywood wall. The Cooperage, explored by TV's Ghost Hunters, was built in 1733 as a mill. In the mid-1800s it was a barrel-making business, and later, a restaurant and a gift/antique shop (it's most recent incarnation). Apparitions, voices and footsteps are among the eerie things often reported here. 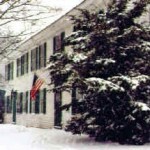 Erected in 1788 and originally a stagecoach stop, the historic inn was believed to have been a stop on the Underground Railroad. A male and a female ghost are said to reside here, and the female is said to be constantly brushing her hair. The dark wooded road reportedly leads to a meadow, a popular teen hangout. It is said to have cold spots and a malevolent force that watches over everyone there. 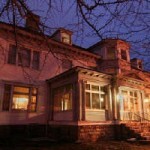 Anna Maria College is believed to be haunted, but the college has somewhat of an affinity for its ghosts. At the Zecco Performing Arts Center, according to resports, two seats are kept open at each performance for ghostly visitors. 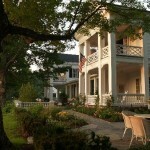 This 1769 resort is said to be haunted by Abraham Lincoln's wife, Mary Todd Lincoln. She visited the hotel in 1865 and has been seen as a quickly vanishing apparition, along with one of her children.